SpineMED™ is designed to ease lower back pain, neck pain and sciatica. Herniated and degenerated discs are among the most common causes of lower back pain. The SpineMED table is specifically designed to treat these types of conditions. It is a medical fact that damaged intervertebral discs seldom heal, as the discs are constantly under pressure. The SpineMED uses proven principles to relieve pressure on vital structures of the lumbar spine and spinal nerves, reducing pressure inside the discs. Recent research utilizing MRI, pre and post treatment on a similar table has shown disc herniations were reduced significantly, depending on the number of sessions performed, while patching and healing of the annulus was also evident. The researchers also found increased water content in the disc, or rehydration of the nucleus. 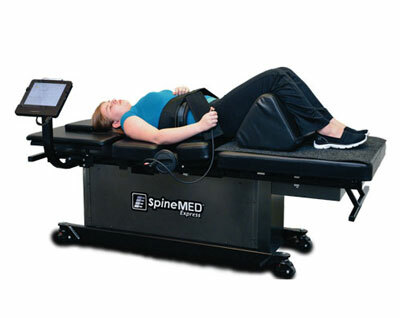 The SpineMED™ does not employ antiquated traction components—traction box, pulleys, drums, ropes and pelvic harnesses—unlike other “Decompression Tables.” The SpineMED™ captures and distracts the human skeletal structure through a unique & proprietary design not found on any other distraction (or decompression) device in the world. If you are already familiar with “Decompression Table Technology,” then you already know the potential results it can achieve. The SpineMED™ has taken this technology to the next level by isolating and distracting spinal segments with astounding effectiveness and unsurpassed efficiency. The efficiency of the SpineMED™ design reduces force requirements, which in turn eliminates any untoward discomfort or patient side effects. The SpineMED™ Table has been designed with tomorrow’s technology in mind, created with modular components to allow “plug and play” replacement. An integral rack-mounted server controls the table’s entire operation. The rack-mounted server facilitates levels of control and functionality (technology unseen in previous table designs). In case of power failure, an integrated battery-backup provides adequate power to operate the entire system for 30 full minutes, thus safely completing the treatment in progress. Previous conservative modalities have provided only temporary relief for the majority of patients. As a last resort, patients turn to costly and painful surgery to treat back pain. However, surgery may not provide the long-term solution. Furthermore, a patient must consider the inherent risks of undergoing any surgical procedure. The well established statistics relevant to back pain indicate that 80% of the population will experience severe back pain, and that millions of people live with chronic back pain. Excessive loading of the spine through changes in our lifestyle and extended periods of sitting while driving or working can cause premature degeneration of intervertebral discs, and repeated injury of the disc annulus. With all of this unnatural positioning and loading of the human spine, there is little wonder that severely damaged discs almost never heal. Nutrition in the avascular disc depends on osmotic diffusion of collagen precursors such as proline, nutrients and oxygen. Diffusion of the collagen precursors into the avascular disc pass through direct channels in the annulus (30%) and the hyaline end plate in the vertebrae above and below (70%). It is estimated that the cycle of proline uptake and renewal in the normal disc (necessary for collagen synthesis and repair) takes approximately 500 days. This inherently slow cycle is additionally compromised in the deranged disc. By lowering intradiscal pressures, Spinal Disc Decompression Therapy greatly facilitates this process and accelerates healing in the disc segment. Accurate and controlled non-surgical decompression of intervertebral discs (decompression, that is unloading due to distraction and positioning) is now possible in an office environment with the SpineMED™ System. Through extensive research, a proven protocol has been developed, which forms the engineering basis for the SpineMED™ System. The application and control of the forces being applied to the patient’s spine is managed through a proprietary electronic system developed by CERT Health Sciences, LLC. This electronic control system employs the latest in computer technology to achieve precision unattainable on any other decompression table. A feedback-loop system monitors the instantaneous table tension being applied to the patient’s spine every 2.5 milliseconds, and will make any necessary adjustments after 8 samplings, for a rate of adjustment of 20 milliseconds. Nylon harnesses, straps, belts, ropes and pulleys within the force generation system, used by other decompression tables simply cannot react and adjust tensions at this incredible speed. While their load sensors are recording changes in milliseconds the true reaction time is significantly longer (seconds longer) as the force is disbursed throughout their antiquated force generation system. The Pelvic Restraints incorporated into the SpineMED™ have made the past requirement for uncomfortable and inefficient pelvic harnesses obsolete. The Pelvic Restraints comfortably secure the patient’s pelvis directly as opposed to securing the pelvis through nylon harnesses. By capturing the patient’s pelvis directly the SpineMED™ reduces the force required to distract the spine, when compared to tables using nylon harnesses. The unique Pelvic Restraints are extensively adjustable, so that virtually ANY size patient can be comfortably accommodated on the table. Unlike nylon pelvic harnesses, which must be secured very tightly to prevent slippage, the SpineMED™ Pelvic Restraint assembly requires only a slight pressure against the pelvis to secure the patient to the moving section of the table. This system is engineered to improve patient comfort dramatically when compared to devices employing outdated nylon harnesses. In addition, the elimination of harnesses, straps, belts, ropes and pulleys within the force generation system considerably increases the efficiency of the application of force to the patient’s spine. With this increased efficiency, the typical treatment tensions required on the SpineMED™ are approximately 60% of what would be prescribed on tables not utilizing the Pelvic Restraint System. The lower tension requirement with the SpineMED™ improves patient comfort and ultimately increases the spectrum of patients suitable for treatment. Clinical experience has shown that the lower force requirements allow the treatment of more frail, sub-acute, and in particular, the geriatric population. The pelvic section of the SpineMED™ pivots, to tilt the patient’s pelvis between zero and twenty-five degrees. Through accurate tilting of the pelvis during distraction the focal point of the distractive force can be moved, so that specific spinal segments can be targeted for the precise treatment of identified pathology. This feature eliminates the unnecessary treatment of additional segments, and any resulting side effects. All treatments are administered with the patient fully clothed. For lumbar treatment, the patient is comfortably positioned on the table, and the Pelvic Restraints are adjusted to comfortably secure the patient’s pelvis. The upper torso is captured by a comfortable securing system incorporated into the fixed section of the table. The Pelvic Tilt section will be electronically tilted, so that specific spinal segments can be targeted.With precise and painless computer controlled tension, the specific disc segment is gently distracted to reduce the pressure inside the disc. For cervical treatments, the cervical unit is first electronically tilted to the angle required to target specific segments of the cervical spine. The patient is then positioned on the table with their head positioned in the cervical cradle unit. The Cervical Restraints are positioned to comfortably capture the base of the patient’s skull for controlled distraction. A typical daily session with patient consists of 30 minutes of decompression on the SpineMED™ Table followed by 15 minutes of ice therapy. The process is painless and safe, and it is not uncommon for patients to fall asleep during treatment. Most patients are expected to find relief of their symptoms between 15 and 25 sessions, while the average recommended course of treatment is 20 sessions. Ideally, the sessions are performed daily with a rest on the weekend. Therapy For Sciatica At the conclusion of the treatment series, when the disc injury has been worked out, patients are given mobilization and strengthening exercises to avoid repeat injury. After only a few weeks of treatment, research has shown outstanding results in easing the debilitating pain caused by degenerative, bulging, herniated or ruptured discs, as well as sciatica, posterior facet syndrome, spinal stenosis, and many failed back surgery cases. Most patients are able to return to normal levels of activity at work or recreation in just a few weeks time.